If you’re reading this, it means you want to know about what information we collect about you, what we do with that information, and what your options are in regards to it. This page will hopefully answer these questions. Anonymous data about your visit will be collected and stored indefinitely. This data includes pages viewed, links clicked, time spent on site, and what sites users are coming from. Information about your location and computer is also collected, including operating system, device type, browser, screen resolution, language, country, and city. This data is anonymous and aggregated and cannot be used to identify you. • To organize the site in a way that promotes content which users are most interested in, and to create more interesting content. • To improve the function of the site (and of our games) for the most common types of devices used. • To consider which languages our games should be translated into, and other localization issues. Your email address will be collected if provided by you. It will be stored indefinitely and will be only visible to site admins. • To contact you in reply to any comment left on this website, where appropriate. For example, if you request assistance with a problem. • A weekly mailing list about site content updates, if you choose to opt into this. If you leave a comment on KupoGames, the name you supply and the comment will be publicly visible. You cannot delete your comments, but we can delete your comment if you contact us. • Google’s use of the DoubleClick cookie enables it and its partners to serve ads to you that are based on your visits to KupoGames and/or other sites across the Internet. • You may opt out of using the DoubleClick cookie for interest-based advertising by visiting Ads Settings. Ad revenue covers the costs of hosting this site. We take reasonable measures to protect the information that we collect from you. Please be aware, however, that no method of transmitting information over the Internet or storing information is completely secure. We cannot guarantee the absolute security of any information. We do not intend that children under 13 years old will visit KupoGames or play our games. We do not solicit or knowingly collect information from children under 13 years old. If you become aware of any personal information we have collected from children under 13, please contact us at the email address at the bottom of this page. His work and content gets a bit edgy and mature at times. 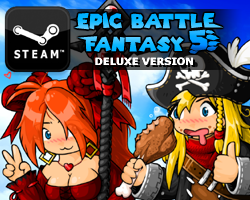 I CAN’T WAIT FOR EBF5! I finally beat GodCat on 4 and I can’t wait to see what challenges our heroes on their next adventure! Hello. I played all EBF series. I like it,really. 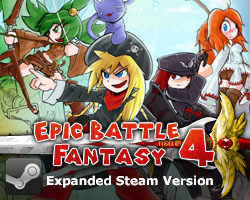 1- Do you need Steam to Fight Evil Natz,Lance,Anna,Matt and NoLegs? 2-Can you tell me a date to when this game comes out?